The author was inspired to write this story because of genealogical family research. It begins in Cootamundra in New South Wales in 1911 when Australia was just six years old. Charles Power was about to marry Iris. The first world war would break out three years later. 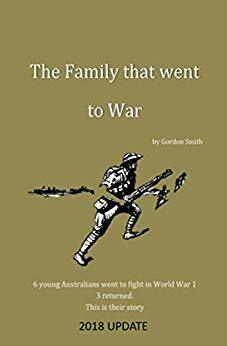 This memoir traces the stories of six young Australians who would leave their homeland to fight in a war for Great Britain. Only three of them would return. The memoir follows the family members who served in Gallipoli and Tripoli. It reflects on the military history of their experiences as well as leave time in France and England. Its language is simple and straightforward filled with the gravity of the situation as well as moments of light humor. When the author starts to reflect on personal feelings, the plot seems to veer off course. Perhaps the author takes too much license in writing about how the brothers perceived the situation. Readers need to be aware that while much of the story has been carefully researched, there is an emotional family attachment. The story ends with Charles and Iris reflecting on the losses the family has suffered as well as the joys of raising their children. The book provides a unique perspective on World War I. Homeschooling parents might want to explore using it to supplement primary sources. Recommended for readers ages ten and older. If you enjoyed reading this post, please subscribe by clicking on the word Follow or by hitting the orange RSS FEED button in the upper right-hand corner or by hitting the orange RSS FEED button in the right-hand corner of this page.